More Drugs Cited As A Risky Mix With Grapefruit : Shots - Health News Some consumers of the bitter citrus fruit may need to rethink their morning routine. Chemicals in grapefruit can interfere with the body's ability to to clear certain drugs. The number of affected medicines has jumped in recent years. Pharmacists are calling for greater grapefruit awareness among physicians and patients alike. Grapefruit can make for a tasty addition to breakfast. But it can also interfere with some medications. Grapefruit sprinkled with a little sugar has just the right amount of kick for a morning meal. But when the bitter fruit is mixed with medication, things can get a bit tricky. 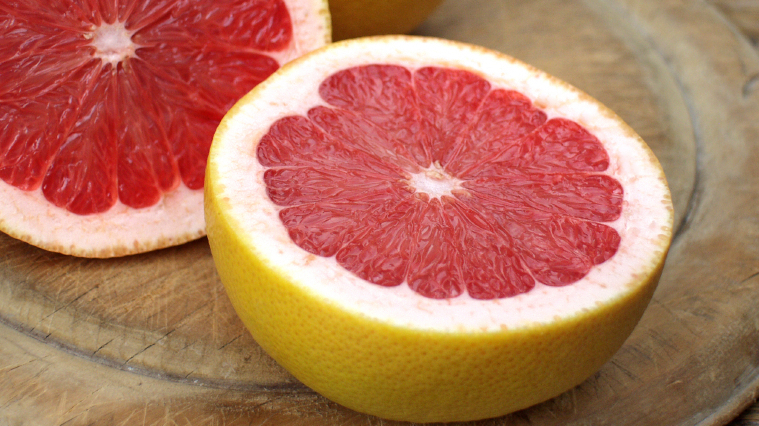 Compounds in grapefruit can dramatically change how some popular drugs work in the body. And the number of drugs that can have severe side effects when combined with grapefruit has more than doubled in the last four years, says a study published Monday in the Canadian Medical Association Journal. Consuming grapefruit while taking certain drugs can produce an overdose effect. "Taking one tablet with a glass of grapefruit juice is like taking five tablets with water," says David Bailey, a pharmacologist at the Lawson Health Research Institute in London, Ontario. Chemicals called furanocoumarins in grapefruit deactivate an enzyme in the small intestine and liver that breaks down toxins — as well as an estimated 50 percent of all drugs. When the enzyme (called 3A4 for short) isn't working right, the drugs hang around longer and circulate at higher levels in the blood than would otherwise be the case. If the levels are high enough, a person essentially overdoses. Bailey and his colleagues pored over clinical trial data and found 85 drugs that can interact with grapefruit juice. These include cholesterol-lowering statins, such as Lipitor, immune system suppressors for transplant patients, and some common antibiotics. Some of those drugs, when combined with grapefruit, cause small problems, such as dizziness. But the mixtures can have more serious side effects, like gastrointestinal bleeding, breathing problems or a deadly irregular heartbeat. Between 2008 and 2012, the number of drugs that could cause serious side effects when mixed with a glass of grapefruit juice jumped to 43 from 17. Bailey says that there's no way to pin the trend on a particular source. The drugs treat different disorders and act on different areas of the body. "Even within a class of drugs it's very variable," says Bailey. The same goes for patient variability. Whether a grapefruit-drug combination might be cause for concern comes down to three factors. The drugs that are taken orally have only a small amount of the drug dose make it into the blood and are metabolized by 3A4 are more likely to cause side effects. The severity of those effects also depends on how toxic the drug is to begin with. Pharmacist Mary Paine, of the University of North Carolina at Chapel Hill, notes that "a major, overlooked aspect of all this is that one juice does not predict all grapefruit juice." Concentrations of furanocoumarins aren't the same for every fruit or glass, so trouble isn't guaranteed. Grapefruit isn't alone in causing problems. Seville oranges — the primary ingredient in marmalade — pomelos and limes contain the same family of disruptive compounds. The side effects are easily preventable, however. Patients can forgo their morning grapefruit juice, or doctors can sometimes prescribe a different drug from to achieve the same results without the grapefruit risk.